Another Digital Signage Expo lies behind us and as usual, it didn’t disappoint! DSE brought us plenty of amazing products to explore and analyze. And although not everyone got an award for their efforts, it’s safe to say that each product had something unique to show. Some products focused more on creating innovative solutions from a hardware perspective, such as making displays thinner, lighter, more durable and accessible. Meanwhile, others focused on eye-catching innovations which drew on creativity of a different kind. Let’s take a look at some of these innovations, starting with the APEX Awards winners. Keep in mind, of course, that APEX Awards entrants are bigger projects than the ones at the floor-show of the event. 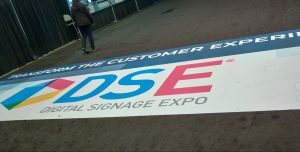 Naturally, we’ll take a look at both and view only a few of the many awesome innovations DSE 2019 brought with it! Undoubtedly one of the most important parts of every DSE is the APEX Awards ceremony, which honors companies for their innovations and recognizes their achievements in the digital signage industry. This year we had 12 categories with 112 entrants, each category awarding a Gold, Silver and Bronze Award. Be sure to explore more if you’re interested in the winners of a specific category. Meanwhile, let’s take a look at some of the innovations which snatched Gold! The APEX Installation of the Year Award, one of the three bigger awards, went to the Revel Media Group for their work on the Hale Centre Theater in Salt Lake City, Utah. The Hale Centre Theatre uses massive LEDs outside on its facade, indoors in the lobby and even as a part of productions. These massive displays aim to provide an even more immersive experience. Although a pretty eye-catching entry, as Dave Hynes of Sixteen:Nine would say, it wouldn't perhaps be the first installation you’d think of when selecting the most innovative installation of the year. From the 12 categories, let’s take a look at only some of the Gold Award winners. Gold in the category Entertainment & Recreation went to the Minnesota Vikings and their Vikings Museum. They were nominated by Dimensional Innovations. In this case, digital technology upgraded the exploration of the history of the American Football team. Interactive displays are everywhere, but new ways of interaction, such as video walls or even an interactive digital book, all make for an immersive experience. This entry also received the Integrator Of The Year award! The gold in the category Healthcare Environments went to Sanford Imagenetics / Sanford Health. They were nominated by Publicis Sapient / Second Story. This composition of digital technologies provides a unique experience to visitors. It starts upon entering the building. Displays greet visitors and show them how their faces and voices are the result of genetic variations. This presentation aims to portray how unique each individual is, and how big of an impact every one of us can make on the world. The Gold Award in the category Restaurant, Bars & Foodservice went to the Indigo Hsinchu Science Park Hotel in Taiwan. It was nominated by Nova Media Co., Ltd. The hotel wanted their bar to be the main feature. It has a strong presence of technology, with displays spanning across the ceiling of the bar, bringing in a new element of entertainment. APEX Awards entries are stellar examples of digital signage and although they are usually parts of massive projects, we mustn’t neglect their small floor-show counterparts. Let’s take a look at some of the noteworthy products seen at the floor-show of DSE 2019! Another interesting product is the ELEVATE interactive solution. This weight sensor triggers a video once a product is lifted off the sensor, and resets once the product is returned. This is an excellent solution for presenting products which typically require demonstration. Some environments which would make excellent use of this product are places where people don’t spend too much time inquiring about a product. For instance, shops at airports are prone to swift visits by travelers who rarely spend large amounts of time browsing. Mainly because shopping isn’t their main focus of the day. But they visit shops and want to see what’s new. Daktronics debuted their new street furniture products at DSE 2019. 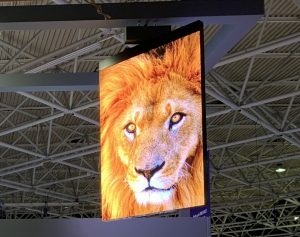 They introduced their new 0.9mm Optica Series of displays, as well as their double-sided rotating LED banner display. Customer feedback helped the company adjust their double-sided display to ensure it was satisfactory! It's thin and light enough to not require additional roof structure, meaning in many cases it's very easy to install. And of course it has double the presentation potential, literally! Hitachi came to DSE 2019 with their new no-touch interactive system. You still need to use your fingers, but instead of touching you simply point and things happen! Eliminating touching prevents certain bacteria from spreading, and reduced the need to clean screens. Plus, it's certainly a more fun and unique way to interact with a display. In case you didn’t attend DSE 2019, as usual, you can take a look what you missed in the official highlights! Furthermore, take a look at the attendees’ impressions during the days of the event, to get a glimpse at what the first hand experience looks like. DSE 2020 will take place at the Las Vegas convention center again. It will open on March 31st and close on April 3rd, 2020. Make sure to mark the date on your calendar! Though, we’ll certainly give you a heads up next year before the event starts!